The bats were acquired at various Bat Days at the Oakland Coliseum over the years. The top one is from 1999 or 2000 and “autographed” by John Jaha. The middle one is from 1976 and has Don Baylor‘s signature. Not sure when I got the third one without a signature, but it was either late 70s or early 80s. Missing is my childhood favorite bat, which was from 1975 and autographed by Bert Campaneris. I played with that bat out on the asphalt of the cul-de-sac I grew up on every day, to the point where nearly all the green paint had been chipped off. Somehow that bat got lost in dozen or so times I’ve moved since then. 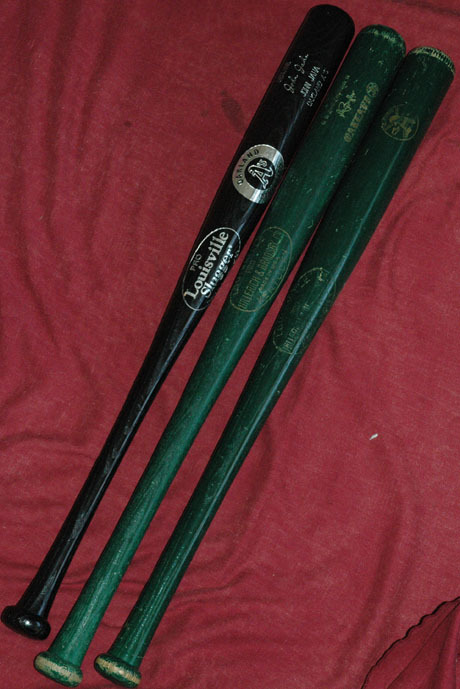 I don’t have much sentimental attachment to these three bats, but I miss my Campy bat. I remember when I got the bat. Back in those days, the A’s didn’t just hand the same bat to everybody. There were bats from nearly every starting player in the lineup, and every kid was randomly handed one when you went through the turnstiles. I went with two of my best friends. “I got Reggie Jackson!” said my first friend. Happy holidays to all my new readers. May you get whatever you are hoping for. Wow, I can’t believe they were still doing bat days as late as 1999. Is this something Oakland still does? With the mayhem potential and alcohol combination I assumed no team did those anymore. The John Jaha bat day is the last full-size bat day I’m aware of. They’ve had a couple others, but they were mini bats.